The burger: After decades of seeing development continually transform the Uptown side of Lake Street, it’s encouraging to see steady signs of life spring up at the far eastern end of one of Minneapolis’ principal thoroughfares. Naturally, food and drink are major driving forces behind this happy revival. The latest example, Peppers & Fries, opened earlier this week, and it's doing double urban duty. Not only have the father-daughter ownership team of Steve Frias and Maria Frias started to draw a steady stream of customers to another E. Lake St. corner, but they’ve managed to yank the blight out of a boarded-up former SuperAmerica outlet, one of those stubbornly blight-inducing properties that can vex a neighborhood for years (witness the long-abandoned former Taco Bell outlet just down the street, which is now also starting to show promising activity; does anyone know what’s going on?). The Frias duo have a lifetime of restaurant management swirling in their DNA. Correction: several lifetimes. Steve’s parents, Guillermo and Gloria Frias, founded St. Paul’s landmark Boca Chica Restaurante Mexicano y Cantina in 1964. Steve also operated his own restaurant, Burnsville's Coronado’s Mexican Restaurante, and along with working in the family business, Marie has been a front-of-house presence in area restaurants for more than a decade. All of that quasi-research has obviously paid off. 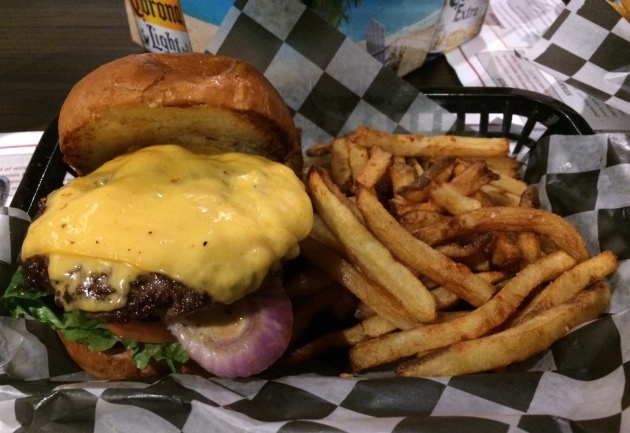 Their menu features nine burger varieties, and a few leap off the page. One piles grilled jalapeños, chipotle-seasoned mayo and zesty pepper Jack cheese, a fiery combo that’s appropriately named the Firehouse 21. Another lays on the bacon, peanut butter and pepper jelly, a totally on-trend combo. But Burger Friday tends to stick to the classics, and in this regard, P & F's COLT burger (American Cheese, Onion, Lettuce and Tomato) doesn’t disappoint. The obviously freshly formed 6-oz. beef patty (the meat hails from Husnik Meat Co., a family-owned South St. Paul processor that has been in business since the late 1920s) was billed as being cooked to medium, but it arrived as a far more palatable medium rare. The thinnish patty reached out to the bun’s outer edges, and its flavorful outer char — evenly seared on the kitchen’s busy flat top — gave way to a lightly pinkish interior with a slightly juicy (if somewhat underseasoned) bite. There’s no skimping on the California-style embellishments. Tucked under the patty is a veritable side salad of crisply leafy lettuce, a few so-so slices of tomato and several rounds of tangy raw red onion, while the top is blanked in salty, melted-to-perfection American cheese. There’s mayo, too, and it’s described on the menu as a garlic aioli, not that my taste buds detected anything that came close to fitting that description. But the generous swipe managed to fulfull all creamy-fatty requirements. Full marks for the no-nonsense bun -- soft, puffed-up, golden, with a gentle toast -- that the Friases wisely order from P.J. Murphy’s Bakery, another long-standing 651 supplier. Add it all up, and it’s a fine example of a burger-joint gutbomb (in the most admiring and affectionate sense of that word) done right. If this were my neighborhood, I’d be calling up the Welcome Wagon. Fries: Included. Meh. Mine arrived looking great: Slim, skin-on cuts that were golden-verging-on-brown and liberally salted. Alas, they turned out to be greasy and limp. I probably should have splurged and gone with the Tater Tots instead; they’re an extra buck. Extras: Although months away, spring can’t come fast enough for all kinds of reasons, not the least of which is the way the Friases have replaced the building’s front wall with a series of glass garage doors, which, when weather permits, will open up to a patio. In the meantime, the super-casual 80-seat room is peppered (no pun intended, honest) with baseball memorabilia, a nod to Steve Frias’ favorite summertime pastime (which probably also explains the all-beef hot dog selection). The appetizer list keeps the kitchen's deep fryer going full-tilt, the bar carries a full liquor license and the Friases have made an effort to pull in local craft beers. Oh, and dessert is ice cream, from nearby Izzy’s. As for the restaurant’s name, it makes total sense. “My dad’s nickname growing up was ‘Fries,’ because his last name is Frias, so that obviously makes sense,” said Marie. “And it’s ‘Peppers’ because Dad always called me ‘My little pepper’ when I was younger.” Sweet, right? Address book: 3900 E. Lake St., Mpls., 612-353-6730. Kitchen open 11 a.m. to 11 p.m. daily, bar open to midnight Sunday through Thursday and to 1 a.m. Friday and Saturday.